In November of 2002, I had to work a gift show in Pigeon Forge, Tennessee. It was the last show of the year for me and I was not looking forward to the first Christmas without Mom. If you have ever been to Pigeon Forge, then you know that they have Christmas stuff year round. This time of year, they were really decked out. Any other time, I would have been hitting all the stores and collecting Christmas things for the family. Not this year. I had absolutely no desire for the Christmas spirit so I did not go into any store. After the show, I packed everything up and headed back to Texas, dreading the long drive and dreading the holiday season even more. It was about 20 miles to I-40, then west for 1100. About 1/4 of a mile from the interstate, I pulled into a store parking lot and parked. It was a place called Old Country Christmas Store. I really didn't want to be here so I poured a cup of coffee and just chilled out for a few minutes. Then I decided to go in. Why not? I have not been to one yet and had been completely successful at avoiding anything "Christmas" up to this point. This place was about the size of a Sam's Club. I went in and started walking down the isles to see if anything would get me out of this attitude. Nothing. After about 20 minutes, I saw this door leading into a side room and decided to go through there and then head out. 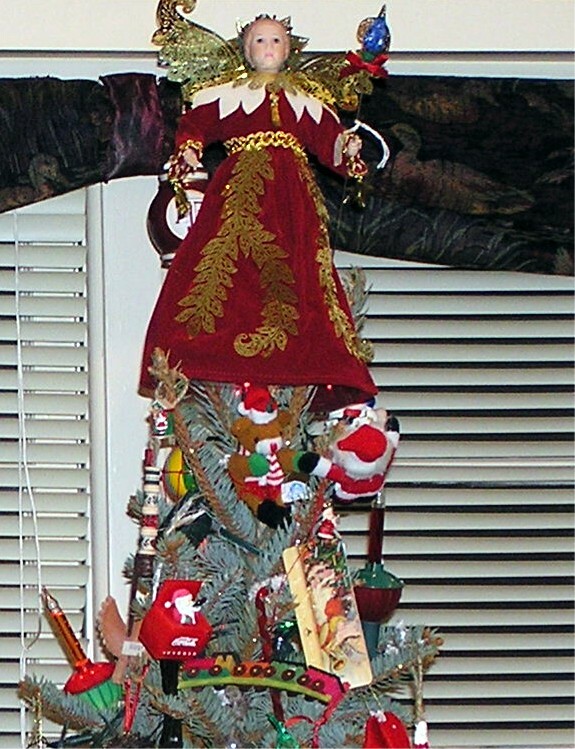 When I walked in, it appeared to be mostly tree toppers. I was about to leave when I turned to my right and something caught my eye. Along the wall on the right side of the room was a huge row of shelves. 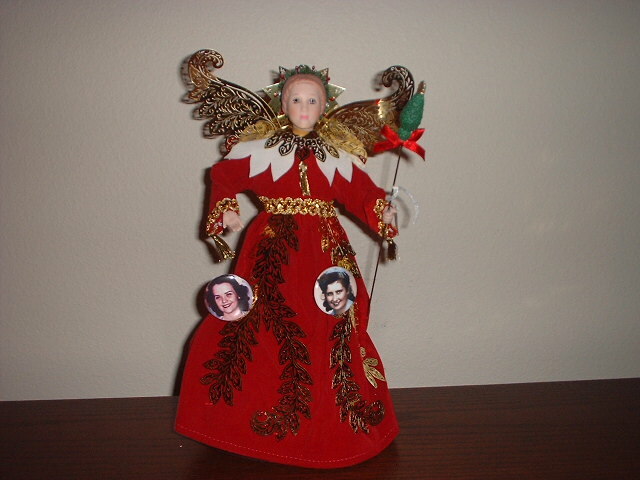 In the middle was a tree topper of an angel with red hair and a red dress with a white collar. Wow! That looks like the lady in my picture! (except for the red dress). I went over, picked one up and stared at it. There seemed to be about 20 or 30 of them on the shelf, center of the wall and at eye level. I held it in my hand and started walking out of the room and down the other side of the store. After about 30 minutes, I did not see anything else that struck my fancy and decided to return the angel tree topper to that room and hit the road. As I walked back into that room and turned right, I could not find where I had found this angel. I saw the others that were next to her on the shelf but not one of this one. How could 20 or 30 of these just disappear?! I walked back and forth by the wall shelf, in and out of the room, nothing! I was actually starting to sweat. Finally, I walked back into the main room and found a young lady to help me. I told her,"All I want to do is put this back where I found it, but I can't find them. There were at least 20 of these on this shelf back here." She said, "I don't recognize this one but I will be glad to help you. Show me where you found it." As we walked in the room, I went straight to the shelf where I found it but there was none to be found nor was there room to put this one back! She gave me a strange look, smiled, and said, "I'll just look it up on the computer." The angel had a white tag on it attached with a string. On one side it had a price of $50.00 with a slash through it, then $17.99 with a slash through it, then $9.99 written in red ink. On the other side were numbers and letters like a stock code. The young lady looked at the tag and said "Sir, I'm not sure where you found this, but all of our items have a bar code and this one does not. I will try and enter this code manually." She tried several different ways but all she got was "Item Not Found"! Finally, she said "I'm not sure where it goes but we can just leave it here and I will do something with it later." At this point I was in a state of shock, frightened, and wondering if I was losing my mind because I was standing there looking at the shelves where just within an hour there were MANY of these angels and now there were none. I blurted out, "Since you have gone to all this trouble, can I just go ahead and buy it?" She said "Sure, I'll just have to ring it up as miscellaneous." Fine. Done. Out of here! I got in my van, poured a cup of coffee, and tried to comprehend what just happened. I KNOW I saw a bunch of these. What happened to them? Why is this happening? Why did I even stop here? I then started crying like a baby and could not stop for at least a half an hour. Once I composed myself and got on the road, I had to call Molly and try to explain what just happened. She could hardly wait to see it. When I arrived at home about 2 days later, Molly almost fainted when I pulled this angel out of the bag. The angel is holding a golden rod with a small Christmas tree on top. Molly used her talent and some paint and turned the Christmas tree into a bluebonnet. "We can have Christmas now. We have a bluebonnet angel." I can't explain what happened in Tennessee, sometimes I find it hard to understand. I do feel that maybe this was Mom's way of helping me get past the stupor I had allowed myself to be consumed in. Christmas will never be the same, but we did have a nice Christmas...Thanks Mom....I love you. The photo in the background of this page was taken right after I came home from Tennessee. You will notice the string on the golden rod. This is the price tag and it is still on there today. Also, this was taken before Molly turned the Christmas tree (on the end of the rod) into a bluebonnet. Below you will find some more photos but first I would like to explain something. Molly noticing the old photo in Mom's den reminded her of the lady in my photo. 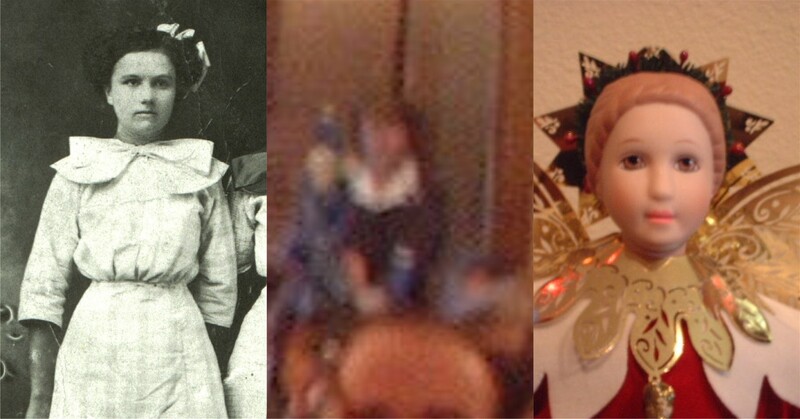 Mamaw was in that photo. The Christmas angel reminding me of the lady in my photo, except for the red dress. It dawned on me this year (2009) that Mamaw's favorite color was RED!! 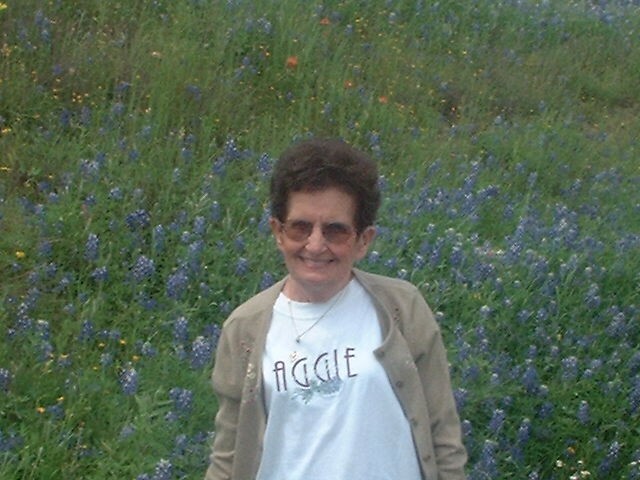 Mom passed on 2/28/02 and was buried on March 4th. Mamaw passed on 3/02/89 and was buried on March 4th! They passed 13 years apart. Mom was 76........7 + 6 = 13. Mamaw was 94.......9 + 4 = 13!....and buried on the same date! All I know is that these are facts. The first Christmas is always the toughest, but I truly feel that my sister Janice and I were both blessed with messages. Here is her story. Janice always liked non blinking Christmas lights, Mom preferred blinking. The tree at Christmas always had both. This Christmas would be different in a lot of ways. Being this would be the first without Mom, Janice decorated her tree with solid, non blinking lights. She did this about 3 weeks before Christmas. Two days before Christmas, Janice was relaxing on the couch watching a movie when the lights on the tree started blinking! For 3 weeks, this had not happened. This went on for 3 to 4 hours! The next day, Christmas Eve, solid all day and all evening. Not one light blinked. Christmas Day, early afternoon, they started blinking and did for about a hour and then stopped.